It can be annoying when you still have patches of hair here and there on your face after shaving. Most people want a clean shave without the tiny spikes of hair left. One of the biggest problems wet shavers face is shaving bumps. This outcome can be downright embarrassing. What causes these unfavorable outcomes is mainly the safety razor used. Sometimes the blades are not sharp enough which results in repetitive strokes. Other times the safety razor is just downright bad. You most likely came here looking for the best products to use so you can get that close and smooth shave you have always wanted. First, we will intimate you with information that will help you choose the best safety razor for you and then present you with top products to choose from. Here we go. What is a safety razor and how does it work? A safety razor is a men’s grooming tool that is used to shave predominantly the beards. It often uses double-edged blades and it gives you the closest shave money can buy. This is one of its biggest advantages over those plastic multiple blades shaving sticks. Another thing is that it is more economical and causes less irritation considering that only one blades creases over the skin. A safety razor is mostly metallic and has a blade hidden somewhere in the head of the safety razor. The edge of the blade is slightly revealed, which is the part that makes contact with the face to cut through the hairs. When shaving, it is important not to apply pressure and maintain a 30 degrees angle between the blade and the face. This is the best way to get a close shave without any resultant irritation. What are the types of safety razors available? One-piece Razor – As the name implies, the entire safety razor is a single piece. It is also often called the silo or butterfly razor. It has a mechanism in it that opens up the cutting head with either the press of a knob or the twist of the handle. This depends on the design the manufacturer opts for. The advantage of this type is that changing the blade is easy and does not require disassembly and reassembly of the safety razor. One downside, however, is that it is difficult to clean. Two-piece Razor – This design has a head you can easily remove with a bar that extends all the way down to the base of the handle. This bar with the attached screw at the base is used to fasten the head holding everything together. The 2-piece razor is a lot easier and faster to clean than its one-piece variant. On another hand, changing the blade is a bit more cumbersome than the one-piece. In the end, it comes down to your preference. Three-piece Razor – The main difference between this type and the 2-piece variant is that the handlebar can be detached from the head. It makes cleaning this type even easier and the design has less moving parts which translate to longevity. These are some of the reasons why 3-piece razors are quite popular. The first thing you might want to consider when deciding on a safety razor is your experience level. An ideal option for a beginner is completely different from what an expert would use. In the world of safety razor blades, there is something called razor aggressiveness. This is essentially the extent of space between the edge of the blade and the safety bar. The more space there is between the blade’s edge and the safety bar, the more aggressive the razor is said to be and the closer the shave you get. 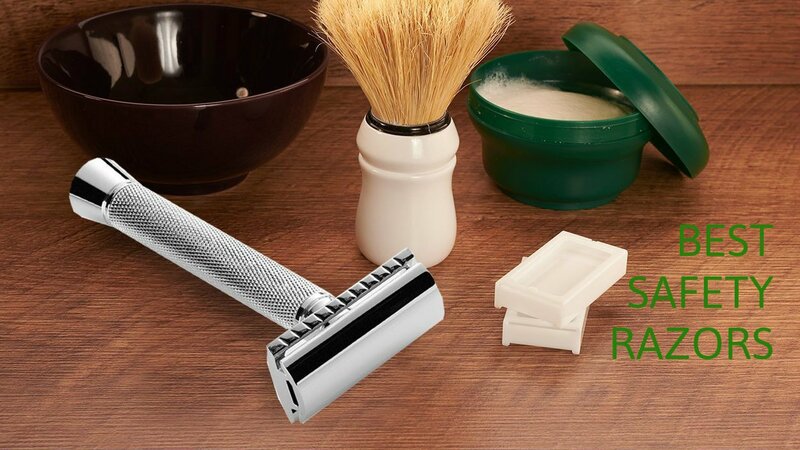 In this case, if you are a beginner, you will want to opt for the less aggressive razors while leaving the aggressive ones for more experienced wet shavers. Alternatively, you could go for one of the adjustable razors which allow you adjust the aggressiveness. That way you can use the same safety razor as a rookie and when you become more experienced. All you need to do is adjust the aggressiveness as you grow. Another design difference in safety razors is observed in their safety bars. There are the open and the closed safety bar designs of safety razors. The closed is the more popular variant and has a solid safety bar which provides an even and tight pressure on the skin. This gives the user some protection against nicks while offering a close and smooth shave. It is a great option for beginner wet shavers. On the other hand, the open safety bar has an opening along the bar which gives it a comb-like appearance, hence the name open comb head. This type is considered more aggressive and is ideal for coarse beards which is why it is more suited to the pros. Another thing you would want to consider is the sensitivity of your skin. If you have a sensitive skin, you cannot just choose a safety razor or other shaving requirements like everyone else. You will need products suited for your skin. For instance, a safety razor with a slant bar head is more suited for your skin than the ones with a straight bar. This is because it allows the blade cut the hair at a slant which is more effective considering your skin type. The safety handle also matters as this is your primary point of contact with the safety razor. For one thing, you should consider how comfortable it feels in your hands as well as the material it is made of. This largely depends on the manufacturer and the design it opts for. There are chrome and stainless steel handles. Some handles are covered with rubber to give you a better grip. Some premium brands use high-quality wood or animal horns for their handles. All these are pure preferences. The length and weight of the handle is another consideration factor. Older users might prefer the lighter razors for stability. If you have a small face, you will be better off with safety razors with the smaller head. If you need to pick one with the bigger head, you would want it to have a long handle as well or you will have to constantly rub cream off your face with every stroke. The above information gives you a good knowledge of safety razors. Now you can continue with reading our detailed safety razor reviews so you can choose the best safety razor for you. Vikings Blade, previously known as Julian Vue, is a brand popular for creating the finest quality in razor blades. Whichever of the names you recognize is an outstanding representation of distinct quality and superior performance. It maintains the classic safety razor design but improved upon with modern craftsmanship and premium materials. This is an ideal brand to get the smoothest and closest shave with. The VIKINGS BLADE The Chieftain Safety Razor is a premium quality and is made with some of the finest Swedish materials for making blades. Qualifying as one of the best single blade razors, its beautifully sculpted design is a master class piece of artwork. This is definitely not one of those plastic, mass-produced variants. The mere feel of it gives you confidence in the amount of effort put into bringing this premium quality razor together. The weight of a razor is one of its measures of quality, and with this in your hand, you will know what quality feels like. This single blade safety razor is one of the fastest to load a blade into. It can be done in less than 10 seconds. All thanks to its patented loading technology. Other safety razors of this kind often use the 3-piece model that you have to unscrew to replace the blade in it. This Chieftain Safety Razor uses the Advanced Butterfly design which flips open on both sides of its hinges giving you access to the blade. This is one of the reasons this product is tagged one of the best safety razors available. This one blade razor also uses a micro comb system which helps to prevent those annoying accidental cuts. This safety razor is designed to help you get that precision you have always wanted while shaving. You can easily make those 30 degrees short strokes without any effort at all. If you use this with the Vikings luxury shaving cream that is your ticket to the closest and smoothest shaving experience you will ever get. This safety razor comes packaged in a suede and leatherette case. This case is of premium quality that will last as long, maybe even longer than the safety razor itself. This is the type of safety razor that can be passed from one generation to another, heirloom style. This is one of the best single blade razors out there and is the type of quality you get with Vikings Blade. Merkur is a world leading brand in the manufacture of shaving equipment. It has been around for well over a century. With its wealth of experience, you can rest assured this is one brand you can totally rely on to deliver top of the line quality with every try. It still maintains its classic design and craftsmanship with a blade for every face type that always delivers the best when it comes to wet shave. Are you tired of those mass-produced shaving sticks that always leave streaks of hair on your face after a shave? Do you want a top of the line shave that won’t leave your face feeling like you just got out of a catfight? If you answered ‘yes’, then the Merkur Classic 2-Piece Double Edge Safety Razor is what you need. This is the ideal upgrade to give you the smooth shave you have always wanted. This is a heavy-duty one blade safety razor made of Solingen steel to give you twice the shave. Several wet shavers have called this Merkur safety razor one of the best safety razor blades they have used. One of the banes of wet shavers is irritation that results in bumps. This is a popularly dreaded outcome of wet shaving, but if done right with the best tools, wet shaving can give you the closest and smoothest shave ever. This irritation-free outcome is what this safety razor promises. With Merkur, no left-over hair, no resultant bumps. 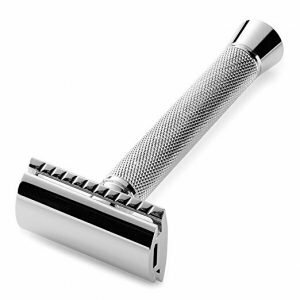 If you want to get the best out of this safety razor, use it in combination with Merkur’s Solingen steel blades. The blades are inexpensive, double-edged, and will give you a close shave that removes even in-growths. This razor uses a unique 2-piece style head that ensures the stability of the blade and easy replacement. It also has the closed comb design that prevents accidental cuts. 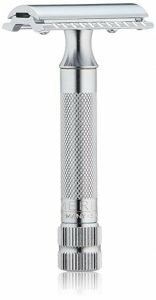 This Merkur steel safety razor is available in smooth stainless steel, knurled and barber pole handles options. You can also have this premium safety razor in stainless steel matte, polished chrome or gold finished. The luxury you get from this safety razor goes beyond the premium shave you get. The aesthetics also adds another dimension to its class. Vikings Blade is a luxury brand of grooming products for men. It prides itself on the use of top quality materials imported from Europe and excellent craftsmanship. Its products are simply luxurious and perform to a professional standard. One good thing about this brand is that as premium as its products is, they won’t bore a hole in your pocket. Top quality and fair pricing are good reasons you should try this brand out. The VIKINGS BLADE The Godfather Safety Razor is a top quality safety razor made of premium quality materials from Sweden. This is one of the best safety razors from this brand and one of the most versatile too. The Godfather razor can either be gentle or aggressive depending on the type of blade you use it. Both rookie and experienced wet shavers can use this safety razor conveniently without casualties. The traditional head design of this Godfather safety razor will take you back in time as you experience the old school style of a premium shave. This hand-made safety razor is carved with a perfect blend of bronze and brass alloys and finished off with well-polished, shiny chrome. You won’t just love this safety razor because of the close shave you get; you will also love it for the touch it will add to your medicine cabinet. If you are a nomadic shaver, it’s your lucky day because this safety razor comes with a bonus travel case made of luxury leatherette and suede. Now you have a place to keep your priced shaving Godfather whenever you are packing for your next journey. 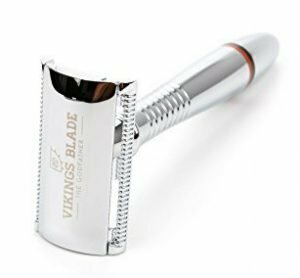 You will get the best shave when you combine this safety razor with Vikings Blade replacement blades. Users have often called them some of the best safety razor blades which is not by any means an exaggeration. To top that up, the manufacturer throws in, as a bonus, 5 pieces of unbranded platinum-coated steel blades. Even though this product goes about its manly nature with so much style, it is still usable by the womenfolk too. In fact, several female users have switched permanently to this product having realized how close a shave you can get with it. We know you don’t want cuts, we don’t too. This safety razor has a micro-comb system that prevents cuts which makes it truly safe to use. Merkur Solingen is one of the world’s foremost suppliers and manufactures of shaving accessories and men’s grooming supplies. A subsidiary of the portfolio of German company Dovo Solingen Steelware, Merkur Solingen is a symbol of quality and grooming excellence. Just for your grooming needs, its blades and razors are made of the highest quality materials with practical designs that will blow your mind away. Merkur Solingen understands that shaving is a process that takes time and precision. For this reason, its products are engineered to give you a pristine shave without hurting or irritating your skin. Its vast product lines include scissors, safety razors, and even items for manicuring, all of the highest quality! Shaving is one of the most enjoyable activities of the average man’s mornings. However, a little nick or a cut can turn things sour in the blink of an eye. That is why we have chosen the Merkur Classic 3-Piece Double Edge Safety Razor to make things a breeze. This men’s safety razor is one of the most durable on the market. This is because it is comprised entirely of stainless steel; a feature that makes it highly resistant to rust and corrosion. 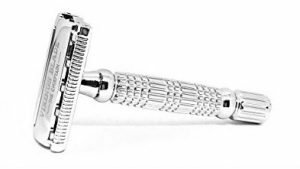 Its chrome finish also makes this razor very attractive and a must have for the modern gentleman. In addition to that, it is very easy to maintain as the stainless steel surface makes it easy to clean. If you are not quite ready to use one stainless steel safety razor for the next few years, then don’t opt for the Merkur Classic 3-Piece Double Edge Safety Razor. Of course, it is no secret that one slip of a safety razor in the wrong direction can lead to painful consequences. However, Merkur is a brand that understands the value of safety. That is why this safety razor has a knurled 3-inch handle that makes the razor very easy to grasp and secure. In addition to this, the sheer length of the handle is perfect for precise, controlled shaving. The possibility of a close shave is one that every man looks out for when purchasing a safety razor. It has a straight bar head which is closed combed. A feat that ensures you have the closest possible shave without getting the dreaded razor rash. Finally, the standard blade gap which is fixed allows you to use this safety razor with regular razor blades. This saves you time, money and stress as you don’t have to look for expensive razor blades that will be compatible with your safety razor. Grooming a man expertly is what Edwin Jagger does and it is a feat that this brand has attained perfectly for the past twenty years. Run by a family and founded in 1988, Edwin Jagger puts decades of valuable experience behind every of its safety razors and grooming items. It is a brand that moves perfectly with the times. For this reason, it incorporates design and innovation in the most balanced of ways. 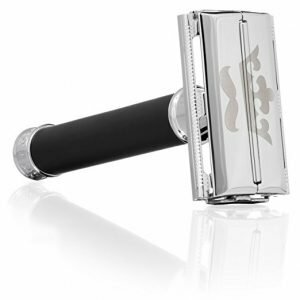 One of the best out there, each product by Edwin Jagger is infused with stylish design, age-old English quality and the latest in manufacturing and production. With Edwin Jagger, your all round satisfaction is a given. The search for a great safety razor for your grooming needs is not an easy one. Different factors have to be considered. However, we can assure you that the Edwin Jagger Double Edge Safety Razor will tick all the boxes you so desperately crave. Keep reading and see what we mean. This safety razor will give you the best in precision shaving. This is due to the classic comb head that it is outfitted with. This design combined with the exquisite engineering will make sure that this razor shaves exactly where you want it to shave with minimum fuss; perfect for both beginners and experts alike. Of course, some might argue that precision is a thing of skill, but what about a close shave? 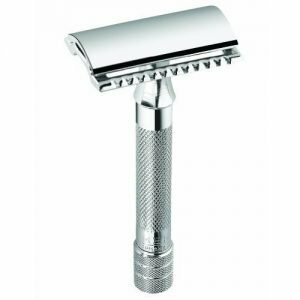 This is a function of the safety razor and the Edwin Jagger Double Edge Safety Razor is one of the best double edge razors in this department. This is achieved with the finely engineered two-part and die-cast blade head. This single feat of engineering gives you a shaving angle guaranteed to give you the best possible close shave. It is also perfect for all skin types including the ultra-sensitive skin types. Accidents while shaving is also a thing of a past with this safety razor. Its handle is lined with deliberate patterns that give you an awesome grip. You don’t have to worry about injuries or cuts anymore while using this blade. Justice won’t be done to the Edwin Jagger Double Edge Safety Razor without discussing its superior craftsmanship. It’s scratch resistant finish and chrome plating makes it great for you in terms of durability. And as proof that the manufacturer believes it’s one of the best double edge razors out there, it also comes with the famous Edwin Jagger name inscribed into it, a mark of authenticity that gives you access to unparalleled customer service. Parker Safety Razor is one of those brands that truly knows what it takes to make your grooming session a breeze. Parker is inviting you to share in its forty-year experience when it comes to making grooming items and safety razors. This is because it is confident that each product has the classic feel and design that will give you the very best. Parker Safety Razor is proud of the standard of its products. Its products are rarely returned, each one crafted and delivered with optimum customer satisfaction in mind. We sure feel like a bet with Parker Safety Razor is a winning one. Shaving is an art form. And like every good painter worth his salt, you need the best brushes to give you the best results. Shaving is no different, even the best at shaving will fail with a safety razor that doesn’t measure up to the required standard. Luckily, we have a safety razor for your perusal that measures up adequately and more. The Parker 99R Heavyweight Butterfly Safety Razor is perfect for your shaving needs and more. The odd drop of a safety razor from the top of your shelves might destroy other safety razors but not this one. It has a solid brass frame that insulates it from drops, cracks, and breaks. Therefore, rest assured that this safety razor will last long without a decline in quality. Looking for a safety razor that will take care of your tough beard? Then you really should give this butterfly safety razor a whirl. Its heavyset design makes it ideal for even the toughest of facial hair. It definitely won’t be cracking under pressure anytime soon. With the sheer weight of this safety razor, you are guaranteed a comfortable shaving experience as opposed to other flimsy designs. The grip is a big part of safety razor blades. Oftentimes we have to shave in slippery conditions and many safety razors employ different methods to give you a strong secure grip. The Parker 99R Heavyweight Butterfly Safety Razor employs one of the most practical methods out there. The handle of this men’s safety razor is 4 inches. To put this in perspective, this is 1.5 inches longer than the average safety razor. The length of the handle combined with the texturing on it makes sure that the handling of this safety razor is as secure as ever. Lastly, this safety razor makes use of a butterfly design that makes it very easy to switch out blades. A simple knob at the base of the razor gives you unfettered access to the blade chambers — simple as A, B, C.
Weishi is a brand that focuses on delivering high-quality products for grooming the perfect gentleman. Weishi understands that the simple act of shaving requires some intricate operations though it may appear so simple. With a bad shaving kit, the aforethought simple act of shaving can become a nightmare for many men, leaving their faces with cuts, nicks and uneven shaves. To ensure smooth and nick free shaving, Weishi makes use of the latest in technological advancement to craft shaving tools that are both highly efficient and also very durable. Some of its products include safety razors, shaving sets, shaving brushes and more. Products from this brand make the art of shaving simple and highly enjoyable. 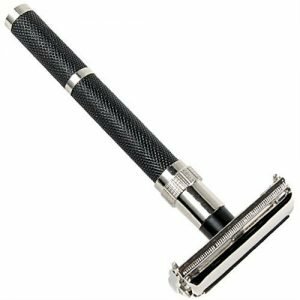 One fabulous product from this brand is the Nostalgic Long Handle Butterfly Open Double Edge Safety Razor. This is a simple long handle safety razor that measures a total of 11cm in length. Its 72-gram weight makes it very balanced to hold while shaving. The balance between the length and weight makes shaving pretty easy. All you need to do is softly hold on to the blade by the tip of its handle, ensure the blade in the razor is angled at about 45 degrees and gently shave. Do not apply so much pressure to avoid getting hurt. Allow the razor’s weight do the job. As you run the razor over the area you want to shave, you will feel the smoothness with which it cuts through the hair, leaving your face smooth and fresh, with no cuts and nicks. You can use it for clean shaves as well as close shaves. You can also use it to carve the shape you want on those beards and mustaches. This is an artfully designed safety razor that reminds one of the vintage safety razors. It is made of good quality metal that ensures its durability. Much more than its sturdiness, the craftsmanship that went into its creation is evidenced in its sophisticated appearance. This is something the consummate gentleman will love to have in his shaving kit. When you make your purchase, your order comes with 5 blades to get you started right away. Changing blades on this safety razor is very straightforward. You will get it done very quickly and safely too. A true gentleman is identified by the simplest of things. One of this is a clean or well-trimmed beard. Nothing makes a man look haggard and unkept like a rough beard or bad shave with loads of cuts and nicks. If you are looking for the perfect gift for a gentleman, you’ve just found it. 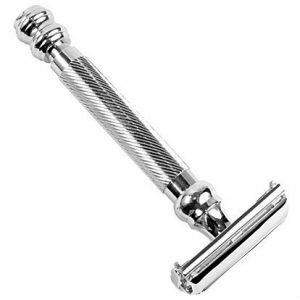 Give him this safety razor and you will be gratified to see how grateful he will be. When it comes to safety razors, hardly can any brand compete with Parker. The name Parker has, for almost half a century, been synonymous with top quality safety razors. The perfect grooming of men world over has been at the fore of the brand’s mission. With products born out of innovative designs and manufactured to the highest of standards, Parker has succeeded many times over in its mission. Despite its huge success in this industry, it has continued to look for new ways of delivering top quality grooming products. Whether what you want is the best double edge safety razor or the best butterfly safety razor, the Parker brand has you well covered. In the Parker 96R, a long handle butterfly open double edge safety razor, the Parker tradition of excellence is evident. Are you a new or old-time wet shaver? Whichever you are, you will find this safety razor to be perfect. It is nicely weighted at about 3.75 ounces and its 4-inch length is plenty for an overall easy shave. It is solidly built with a durable brass frame so you can be sure it will last you for many years to come. When you hold it in your hands, the textured handle ensures it stays in place as you carry on with the task of shaving even with slippery hands. When you place your order today, it will come with 5 shark super chrome blades which help you get started with your shaving immediately. Putting in the blade or replacing an already used one is a breeze. All you need to do is twist open the butterfly door, put in the new blade, twist it shut and you are good to go. It cannot be easier than that. Yeah, we know this is not a device that is put on public display but we must say that it sure does look very lovely. Parker, as with all its products, took some time putting this together. As is standard with the brand, this product is hand assembled to ensure the highest quality standards. Reading through double edge razor reviews, you will find that most users find that products from Parker stand heads and shoulders above others. Are you ready to join the elite class of parker users? Get the Parker 96R – Long Handle Butterfly Open Double Edge Safety Razor and enjoy wet shaving at its best. With Perfecto, every aspect of the shaving ritual is special. From the lineup of the shaving kit on the sink top to the actual shaving process, Perfecto delivers perfection all the way. As a manufacturer of top quality shaving tools like safety razors, shaving bowls, shaving brushes and shaving stands (among others), Perfecto delights in the provision of products that are not only top quality but also very affordable and beautifully crafted and packaged. Products from this brand are perfect for personal use and also excellent for use as gift items. One of such products from Perfecto is the Perfecto Professional Double Edge (DE) Safety Razor for Men. Designed to deliver the closest shave without a hint of irritation, this safety razor is one of the best safety razors for sale today and the solution that many men have been searching for. With a handle that measures about 3.5 inches and a weight of about 1.7 ounces, this razor offers a perfect balance that makes the application of just the right amount of pressure for the perfect shave very easy. Your shaving time no longer has to be a time of personal torture; a time when you lavishly design your face with cuts and nicks. This blade makes it easy for you to achieve a clean shave without taking some pieces of your face with it. This is not a butterfly opening razor. However, it is easily one of the best double edge safety razors you will find right now. It does not only get the job done to perfection, it also looks really lovely in its chrome finish. While you shave, you are likely to have your hands wet and slippery which could make you grip unsecure. Well, with this safety razor, this is not a problem at all. Its long handle is textured to always give you that secure grip you need to guarantee a perfect shave. This safety razor will serve you for many long years as it is made of very good quality materials to ensure its durability. Perfecto is so sure of its product that it offers a money back guarantee on it. Order it and if you don’t like it, send it back for a refund. If anything proves a brand’s belief in its product, this certainly does. You’ve seen it all. Get that perfect shave you’ve always craved and if not for you, get this as a gift for that wonderful person and the satisfaction on their face will leave you feeling warm inside for a very long time. With an understanding of how important it is for gentlemen to have proper grooming tools, Shaveology has with innovation and creativity reinvented the seemingly old-school art of shaving with safety razors. These products give today’s gentleman that classy look without taking anything away from his modern looks. With patented products that are designed to be top quality, lovely looking, highly durable and very affordable, the days of shaving anyhow are gone forever. Shaveology presents its Luxury Safety Razor which comes with 5 platinum double edge safety razor blades. This is a gentleman’s perfect solution for wet shaving. This safety razor offers a very smooth shave without the nicks and cuts associated with many other razors. First, it is perfectly weighted for easy shaving and the handle is textured to give you a firmer grip on things. When you use this, you will understand what Shaveology means by “shaving is not just about the result, it’s about the experience”. As you feel the blade caress your skin, gently taking away the hair while leaving your skin intact, you will understand what it means to enjoy the process of wet shaving. 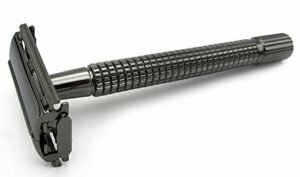 This razor is so precise in its operation that you can use it not only for clean shaves but also to trim those beards, giving them perfect lines. Other than shaving and trimming your beards, you can also use this for shaving your legs, armpits, head and more. No wonder many ladies have also joined the Shaveology club. We’ve talked so much about how efficient this safety razor is and it is indeed efficient. 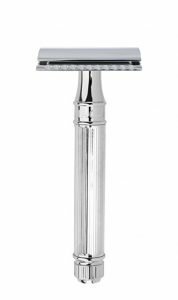 However, did you know you can also make huge savings with this safety razor? Let’s break it down for you. How many disposable blades do you think you will go through in a year? Let’s even leave the fact that they do not do a great job of shaving your hair, ending a lot of times shaving some part of your face. If you can hazard a guess, multiply that amount by any number of years of your choice and see what you are wasting on inferior products. With this safety razor, you get it once and use it all your life. All you need to do is change the blades. Apart from the huge savings, you will be making, you will also be helping the environment. Let’s shock you with this statistic. Every year, about 2 billion disposable plastic shaving sticks are thrown into various landfills in the U.S.A. Can you imagine the impact of that on our environment? With this safety razor, the environment will not have to be subjected to such sad treatment. While this is not a Merkur long handled safety razor, it is easily the best butterfly safety razor or one of the best you will find. Get this for yourself or as a gift for that wonderful person in your life. Shaveology is so confident of its product that it offers a full lifetime money back guarantee on it. That sure is some confidence. Enjoy the best of wet shaving today. We’ve walked you through things you need to consider before buying a safety razor. Furthermore, we gave you our top picks (ten of them). Now that you are better informed, why NOT get yourself the best safety razor and get that shave you’ve always wanted.